Did you know that this day is actually meant to celebrate all of the achievements both social and economic that workers have made? Me either! I just thought it was a day of rest for those of us who LABOR long hours. But it was begun as a yearly national tribute to the contributions that workers have made to the strength, prosperity and well being of the country. Taking all of that into consideration, it places a whole new view on this day for me. 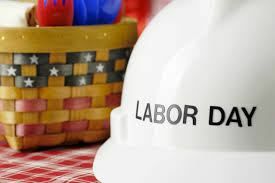 I am thinking that instead of racing out to the stores for all of the Labor Day weekend sales, maybe we should really celebrate with some of those we labor with. Raise our glasses and give a toast/testimony to all we have done in the past year. Celebrate all we have in common instead of focusing on what can separate and divide us. We are all laborers no matter what we are doing. From school teachers,construction workers,plumbers,electricians as well as those who labor in service in other ways.There are doctors who are in emergency rooms dealing with responsibilities that would drain all of the emotional energy from most of us. Lawyers who represent those who they cannot spare from incarceration or worse. This is not to mention our public servants,the police,firefighters and emergency medical technicians. These folks are usually the first one’s on the scene. they see and deal with things that require a strong demeanor. They possess qualities that allow them to remain calm and collected while those they are serving fall apart. Since I cannot be with all of those who work beside me today, I raise my glass of Iced Tea to all of YOU! Reach out and raise your glass of coffee, tea or whatever and give testimony to other’s greatness! They may just return the favor!